I am gradually, as you may have seen, working through the list of ships involved with the Volturno rescue. But it is getting harder and harder to find data of any sort as one works down that list. 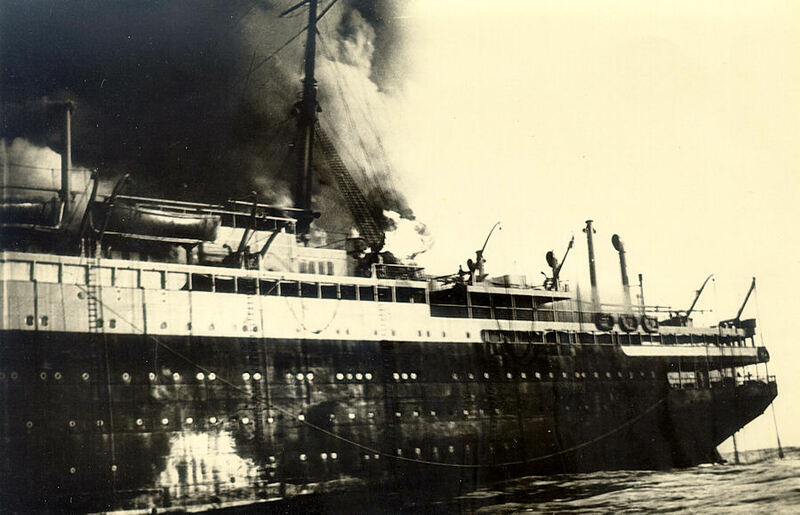 But we will do what we can, with this page dedicated to such data as can be found about the Seydlitz, which landed 46 Volturno survivors at Philadelphia, U.S.A. in Oct. 1913. Hopefully the page will expand as new data becomes available. I like to start off with a full size image of the vessel to give you a quick idea of what she looked like. In Seydlitz's case, I do not yet have much by the way of images. But I do have a good & large postcard image ex e-Bay that you would enjoy. I trust that I may be permitted the use of the image on this non profit & informational site. Another copy of such a postcard was sold on e-Bay in September 2005 - for EUR 2.59 or approximately U.S. $3.18, I believe. And another sold for U.S. $8.50 on e-Bay in early Jul. 2006. And I now have also a postcard sized photographic image of the vessel, but its dating is not known. I would seem, for some reason, to have lost some of the image detail, with my scanning of it. And here is a very beautiful postcard indeed of Seydlitz. Which graces this page thanks to the kindness of Reto Raeth, of Zurich, Switzerland. I learn that Reto has a website - named 'Postcards Ocean Liners' - that specialises in maritime postcards. 9 pages of postcards today. You can visit his site here. Do drop by! The Seydlitz cards seem? no longer to be there? In the absence of other images, I offer two additional postcard images, also ex e-Bay. Hopefully in the future, a good photograph of the ship might surface of the quality of the Kroonland 'Panama' image that you can see elsewhere on this site. Now there are many references to the Seydlitz but most of them relate to the German Battleship of that name. Re our Seydlitz, I provide data from a number of sources but primarily from a website that provides data that was originally posted to the 'Emigration-Ships Mailing List' by Michael Palmer on April 17, 1998. My interest is mainly related to the Volturno, of course, so I have cut quite a bit of the detail, all of which is visible at the link just provided which includes the original sources for the data. Thanks you for that, Michael! 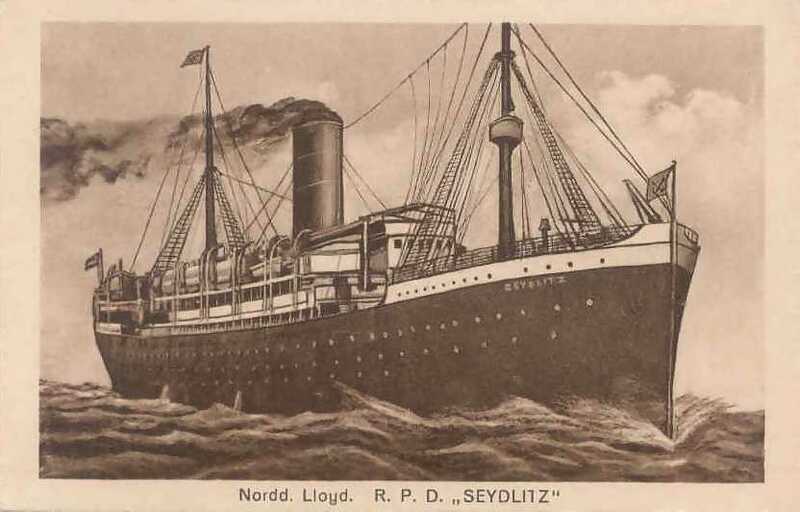 Seydlitz was built by the F. Schichau shipyards at Danzig, Germany for the North German Lloyd Lines (Norddeutscher Lloyd) & was launched on Dec. 25, 1902. 7,942 gross tons. 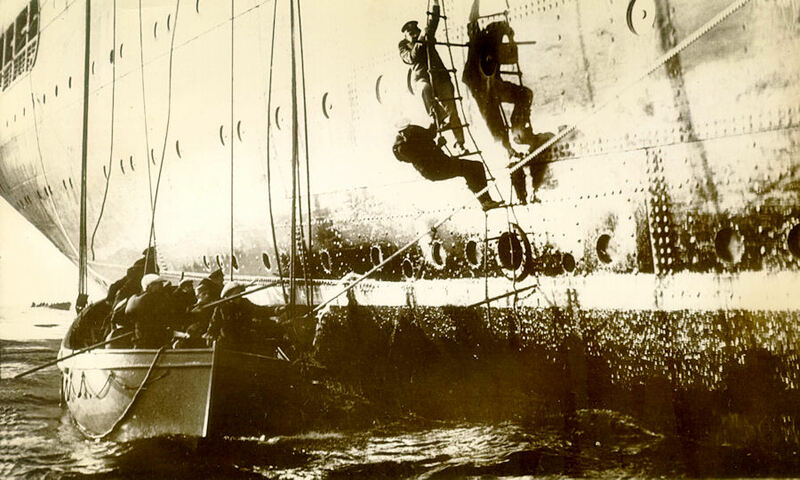 On Aug. 5, 1903 she started her maiden voyage from Bremen via the Suez Canal to the Far East. She was 450.1 feet long (143.15 metres), had a beam of 55.5 feet (16.88 metres), two propellers & triple expansion engines. And, as you can see above, she had one funnel & two masts. Her service speed was 14.5 knots, & she could carry 2,050 passengers - 101 in first class, 115 in second, 134 in third and 1,700 in steerage. (I read one other reference, however, which said that she could only accommodate a total of 1,900 passengers). Her crew was of 155/190 total. 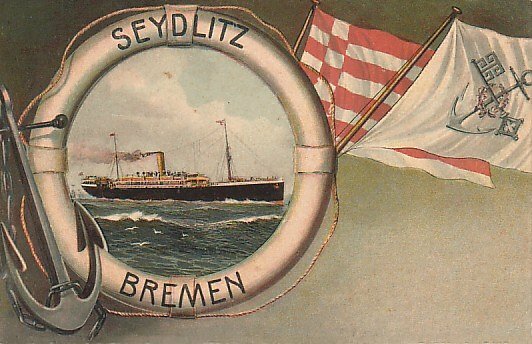 In the years before she was rebuilt - at Newcastle in 1906, Seydlitz completed many roundtrips from Bremen - 6 to the Far East (An e-Bay item in Mar. 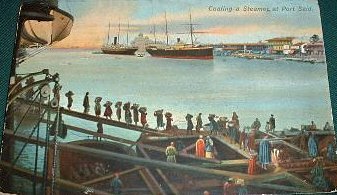 2006 from a German vendor mentions one such trip, commencing from Hamburg in fact, on Aug. 11, 1906 via Columbo & Shanghai to Yokohama on Dec. 31, 1906) and 18 to Australia, all via the Suez Canal. And between Mar. 1906 and the summer of 1914, Seydlitz completed 7 trips to New York, one to South America, and just one trip to Philadelphia. I presume there must have been many more voyages, not mentioned. That last trip to Philadelphia, which commenced on Oct. 3, 1913, was clearly the trip in progress when the Volturno met her fate. I needed help with this next paragraph since the texts that I had earlier read were to me at least most confusing. In that regard I thank Henry Treece of Sydney, Australia, for bringing to my attention errors in my earlier version of the paragraph. A corrected text follows. Henry has kindly provided me with his suggested alternate paragraph which I now also include - below. On Aug. 3, 1914, with WW1 in progress, she fled Sydney, Australia for South America. Cimorelli advises that she acted as a support vessel for the Graf Spee Squadron for the Battle of Coronel (Nov. 1, 1914) and the Battle of the Falklands (Dec. 8, 1914). But I am advised that that is not so, at least re the Battle of Coronel, & that she sailed directly from Sydney, Australia, to Argentina where she laid up at Bahia Blanca at the southern end of Buenos Aires province. It would seem she then left Argentina in early Nov. 1914 for Valparaiso, Chile, the principal mobilisation centre for German reservists & volunteers from all parts of South America. She then left Valparaiso, loaded with coal, & on Nov. 21, 1914 arrived at St. Quentin Bay, Gulf of Penas, on the south-west coast of Chile. A while later, on Dec. 6, 1914, the vessel, now part of Admiral von Spee's squadron, lay in the lee of Picton Island, at the south-eastern tip of South America. There, in sheltered waters, von Spee took on board his squadron's ships the 2,800 ton anthracite (coal) cargo of Drummuir, a captured British barque that had been bound for San Francisco. 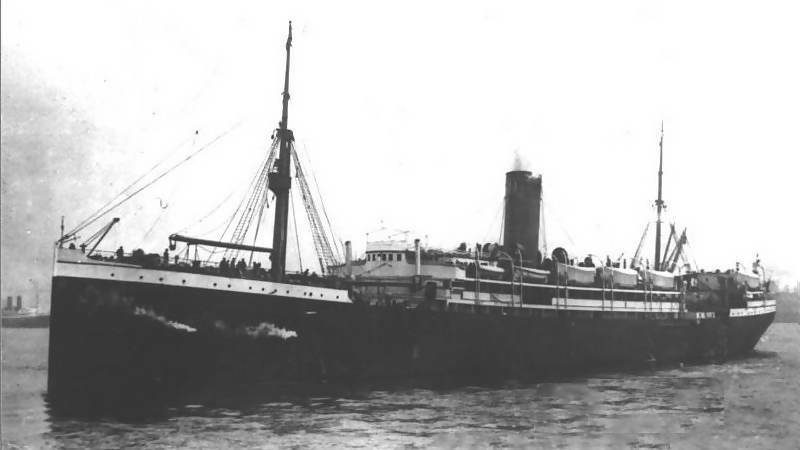 The crew of Drummuir were taken aboard Seydlitz & Drummuir was taken out to sea & sunk. Did Seydlitz discharge her cargo of coal when at Picton Island, I wonder? Anyway, said to be acting as a hospital ship, Seydlitz accompanied von Spee eastwards to the Falkland Islands, would seem to have taken no part in the direct action, & escaped when British vessels became closer than those of von Spee. She would then seem to have travelled back to Argentina & took refuge at San Antonio Oeste, on Dec. 18, 1914, declaring herself to be 'a hospital ship'. The Argentine authorities were not deceived & condemned her as a German naval auxiliary. This page is most helpful about all of this history as is this Wikipedia page. There she was interned & in 1917 her crew damaged the engines to prevent her seizure by Argentina & her charter to the Allies. Repaired, & perhaps still under German command, she sailed on Jul. 24, 1917, from Bahia Blanca to Bremen via Montevideo & St. Vincent. I cannot spot what she did after arriving in Bremen. But that 1917 data which also originates with Cimorelli & Cimorelli quoted sources, I presume, may well be incorrect also. Many sites state that Seydlitz was interned in Argentine for the duration of the war. We sincerely thank Henry Treece for his alternate paragraph as follows. On Aug. 3, 1914, the day before Britain declared war on Germany, Seydlitz unexpectedly left Sydney, Australia, bound for Hamburg via Perth. Rather than heading south and west, the ship travelled east to Chile in South America. According to Corbett, Seydlitz was in Valparaiso for most of Sep. 1914 and then stole out of the harbour without a clearance. The ship proceeded to Juan Fernandez Island (= Robinson Crusoe Island) to rendezvous with Admiral von Spee's East Asian Cruiser Squadron. On Nov. 21, 1914 the ship was with the squadron in the Gulf of Penas (= St Quentin Bay) on the south-west coast of Chile. There is some confusion as to her role with the squadron as British sources describe her as a collier while Pochhammer, the first officer of the Gneisenau, was told that she was a hospital ship (but she had no external markings). The squadron then proceeded south and rounded the Horn at midnight on Dec. 1/2, 1914.�Near Cape Horn Leipzig captured the Canadian barque Drummuir which was carrying coal to San Francisco. At Picton Island, her coal was transferred to the German ships and the Drummuir crew was placed on Seydlitz. According to Captain James Eagle of Drummuir, the Seydlitz had been fitted out as a storeship. The squadron remained at Picton Island for three days and this proved to be their undoing. The squadron proceeded to the Falkland Islands arriving on Dec. 8, 1914 but the much stronger British squadron had arrived a day earlier. Seydlitz was spotted with two other auxiliaries by local residents who thought that they might be carrying troops. When the main squadron left the islands, Seydlitz was ordered to follow as a hospital ship. Captain Eagle of Drummuir was on the bridge of Seydlitz during the battle and said that the ship changed course after the sinking of two German cruisers and travelled south as far as the ice fields. The rest of Admiral von Spee's squadron apart from Dresden was destroyed. Seydlitz sailed to Argentina and visited San Antonio Oeste on Dec. 18, 1914 releasing the crew of Drummuir. Short on fuel, the ship put into Bahia Blanca and on Feb. 14, 1915 was interned (Webmaster's note - See Drummuir, Dec. 02, 1914, near page bottom). According to Cimorelli, in 1917 the Seydlitz crew damaged the engines to prevent her seizure by Argentina and her charter to the Allies. They also say that the crew repaired the damage and she sailed on Jul. 17, 1917, from Bahia Blanca to Bremen via Montevideo and St. Vincent (i.e. Sao Vicente in the Cape Verde Islands). Other sources say that Seydlitz was interned in Argentina until 1919 so it may be that the return to Bremen was in Jul. 1919. Again some time gaps! After the Armistice, she resumed South America service in late 1921, & then switched to the Bremen-New York service through Sep. 1927. In the next years she travelled via Halifax, Canada, to New York or Galveston. She was, I read, scrapped at Bremerhaven in 1933. And next is another image of the Seydlitz, dating from 1909, kindly provided by John Erwin of Australia. John advises that his grandparents, Henry and Emily Miller, left England in late 1909 to emigrate to Tasmania, Australia. 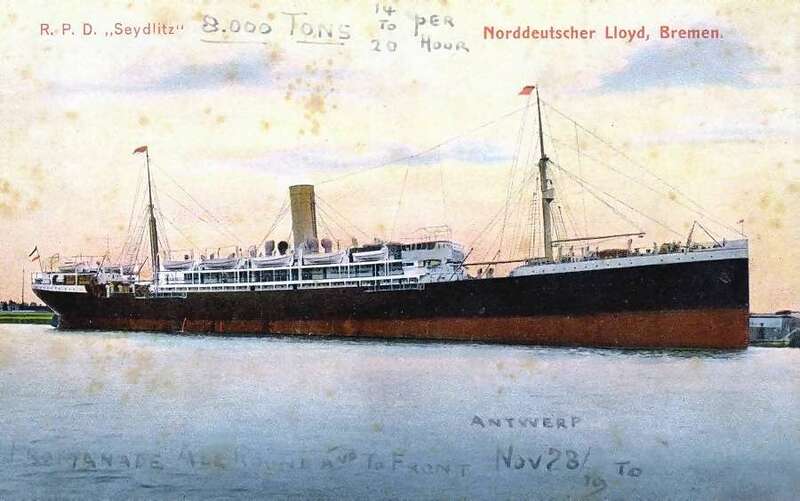 They left Antwerp aboard the Seydlitz & travelled via the Suez canal to Perth in Western Australia and then on to the eastern Australian ports. The Millers were from Hemel Hempstead, in Hertfordshire, & an article on their experiences was later published in the Hertfordshire Hemel Hempstead Gazette and West Herts Advertiser. En route they visited Naples, Italy, arriving late in the evening, and described the Seydlitz coaling operation there in words that you may find interesting. John further advises me that at the time of that voyage there was a dock strike in progress at Fremantle, Australia. And that when the vessel stopped at Columbo, en route to Australia, Seydlitz took on extra coal. I presume that the bunkers were full as they had to store the excess on the promenade deck! The loading operation would surely have been a similar sight to the inset image above which is of coaling at Port Said, Egypt, also in 1909. From an e-Bay item sold in late Apr. 2006. John Erwin, we thank you! On Jan Daamen's site there is a list of the members of the crew of the Seydlitz - provided by Tony Jones of North Wales. I earlier had described that list as a list of crew members who received medals re the Volturno rescue, but I think now that was a little inaccurate. Though most of the following list surely did receive medals. How do I know that? See the text at the very bottom of Page 8 where it states that Board of Trade medals were only distributed to the Seydlitz recipients or next of kin in 1924 - World War 1 having been the cause for the many years of delay. The medal numbers on that page, (Seydlitz and Grosser Kurf�rst combined), do not agree quite perfectly however with the two crew lists even when one excludes the Captains - who likely would not have been granted medals since they would not have been personally involved in the physical rescue efforts. Here, with his kind permission, is Tony's complete list. 34 names in total. Thank you, Tony! I have added in German accents re two of the names. Now it would seem that 'Deutsche Gesellschaft zur Rettung Schiffsbr�chiger (DGzRS)', granted medals & provided cash awards to Seydlitz crew members involved with the Volturno rescue. DGzRS is a long German established life saving society indeed, dating from 1865. The name translates as 'German Society for the Rescue of the Shipwrecked'. They have an extensive German language website here�but the sole English page (if I am correct) is here. Do read it! It explains the Society's purposes & history. It would seem that they continue to be involved today in a major way in sea rescue in both the North & Baltic Seas, and have, astonishingly, 184 full time rescue personnel, about 800 volunteer rescue personnel both men & women, & about 80 voluntary physicians. My word! How splendid. There was also 8,000 Marks in cash distributed - perhaps to the German�rescuers of both Grosser Kurfurst and Seydlitz who did not receive medals. I try not to repeat content within these pages. So page 71 has an image of what such medals would have looked like. Greg Jefferys of Australia, historian of the Seydlitz, advises me that that Captain Hagenmeyer was killed at some time in Dec. 1914 at age 54. 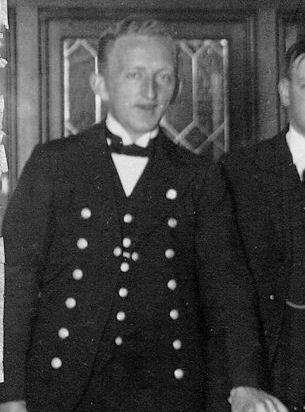 Greg presumes that he would have been aboard Admiral Graf Maximilian von Spee's flag ship SMS Scharnhorst which was sunk with the loss of all hands (including von Spee and his two sons) at the Battle of the Falklands. Thank you Greg! The text at left, which appeared in the Calgary Herald newspaper of Calgary, Alberta, Canada on Nov. 14, 1913, clearly relates to the data just covered. Indeed the mention of those awards, in that tiny article, was the inspiration for Bernard de Neumann to undertake the research he has now so successfully completed. For many years this page has recorded the following re R. or Karl Moecker - 'While I cannot show the medal to you, because I have no image of it, it would seem that the SGM (Sea Gallantry Medal), foreign service, issued to Moecker, a steward aboard Seydlitz, was sold at some time in the past by Liverpool Medal Company ~ of Liverpool, U. K., where else! He was named Karl Moecker rather than R. Moecker as listed above. It would seem that they also sold a bronze medal issued to Moecker by The Life Saving Benevolent Association of New York. But in late 2007, more data emerged. And in Oct/Nov 2010 even more data as is recorded below the image which follows. We now have an image of three actual medals issued to Moecker, be he correctly R. or Karl. I am advised that on Oct. 9, 1923, Moecker was sent his silver Sea Gallantry medal, foreign service, together with the cash payment, i.e. �3 a-head but paid in German marks, awarded to him in 1914. Now �3 a-head, in 1914, was a significant sum indeed, the equivalent of 3 to 4 weeks average wage! But by the time he received it, in 1923, the sum was made essentially worthless due to currency changes as a result of WW1. He acknowledged receipt in 1924. I have no detail as to Moecker personally whatsoever. Maybe someday, one of his descendents may see these words & provide some biographical information. Anyway here, thanks to a kind collector in the United Kingdom, are Moecker's three beautiful medals. At left, 'The Prussian Medal of the Order of the Crown' - 5th class (which is actually, I am advised, the 'Medal of Merit'). 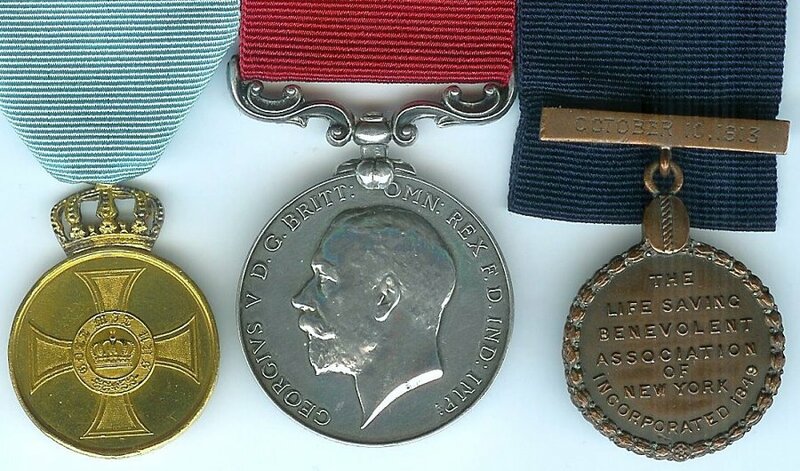 In the middle the Sea Gallantry medal, foreign service & in silver. And at right the bronze medal of 'The Life Saving Benevolent Association of New York'. Fine looking medals, all three of them! In late Oct. 2010, a message was received from Karl-heinz M�cker, of Goslar, Lower Saxony, Germany. And we can now tell you more about Karl M�cker, as the name correctly should be recorded, the steward aboard Seydlitz, who earned the above splendid medals for his heroism respecting the Volturno tragedy in 1913. I should first indicate that Karl M�cker (1892/1975) was Karl-heinz M�cker's grandfather. Karl, who was the son of Carl M�cker, was both born & died at Goslar. He married Margarethe G�rtner (1899/1991) & the couple had two children, Karl-heinz M�cker (1934/2010), an electrician, & Manfred M�cker (19 /2008), a confectioner. Karl-heinz in turn married Sigrid Nolte & they had one child, our Karl-heinz (1956/ ), a communications engineer by profession. The parents soon divorced & Karl-heinz lived with his mother, who remarried. 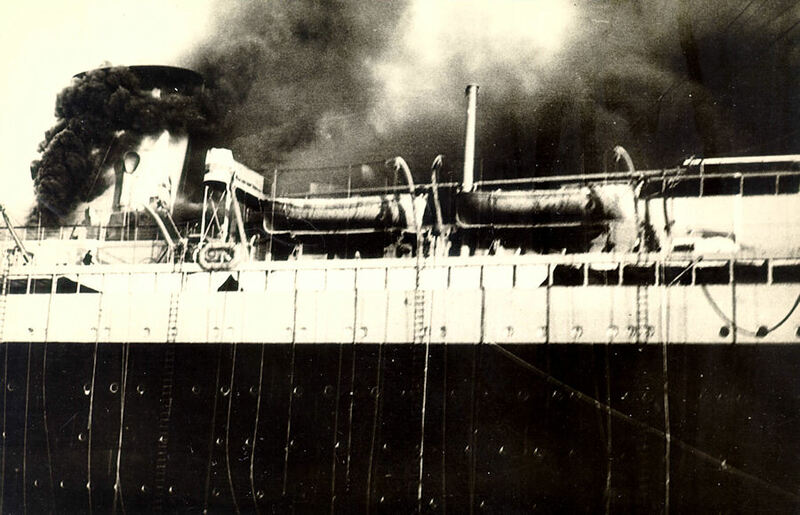 Karl M�cker served, as we know, as a steward aboard Seydlitz, & also served in a similar capacity aboard a number of other vessels including Columbus, (left), a 32,354 ton passenger ship, then the 13th largest steamship in the world, owned & operated by Norddeutscher Lloyd, built in Germany in 1924. 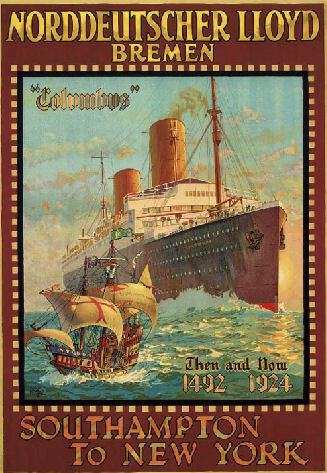 Columbus was on a cruise at the outbreak of WW2 on Sep. 1, 1939 & put into Vera Cruz, Mexico, to re-fuel. Its Captain hoped for an opportunity to be able to make a break for home. The ship left Vera Cruz on Dec. 14, 1939 & proceeded up the eastern seaboard of the U.S., shadowed by U.S. warships, before breaking eastwards for Germany, when abreast of Delaware. On Dec. 19, 1939, Columbus was apprehended by Hyperion, a British destroyer, ordered to heave to & not to use her radio. Two shots were fired across the bow of Columbus. Captain Daehne, of Columbus, had planned for such a situation & knew well what he would do. He set the vessel on fire & scuttled it 420 miles SE of New York. (images 1 & 2). 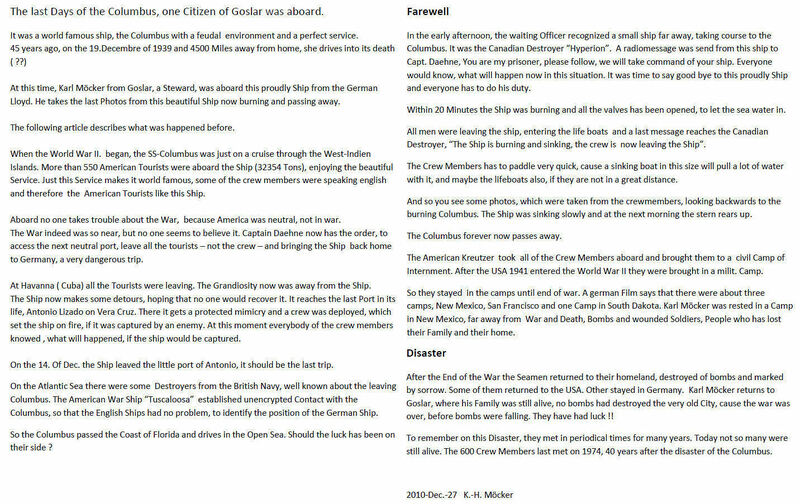 All but two of the Columbus crew took to the lifeboats, 577 of them. Since Hyperion had no facilities to handle such a number, Tuscaloosa, a U.S. Navy 'New Orleans class' heavy cruiser, assumed the rescue role & took the crew to Ellis Island, New York. Now Wikipedia indicates that most of Columbus's officers & men returned, via the Pacific, to their native land. But that did not apparently happen to Karl M�cker. He was held in New Mexico as a prisoner of war for the duration of the war. And only when WW2 came to an end, did Karl return to his native Germany. He worked in the following many years as a steward in a number of Goslar hotels, (Hotel Golderner Stern, Hotel zu Tanne, Hotel Ritter Ramm). Alas, he lost a leg, late in life, a condition Karl-Heinz describes as 'smokers leg'. He died, at Goslar, in 1975, at age 83. 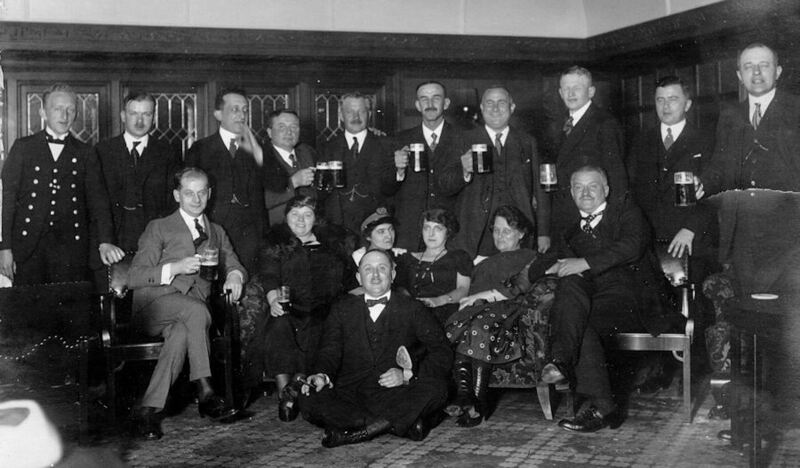 Karl-heinz has kindly provided an image of his grandfather, Karl M�cker, (at left), on duty at a convention believed to be of crew members of Sierra Nevada. The complete image is next on the page, Karl being at the extreme left. And lower on the page are other images provided by Karl-heinz. i) A dramatic image, taken from a lifeboat, looking back towards the burning Columbus. 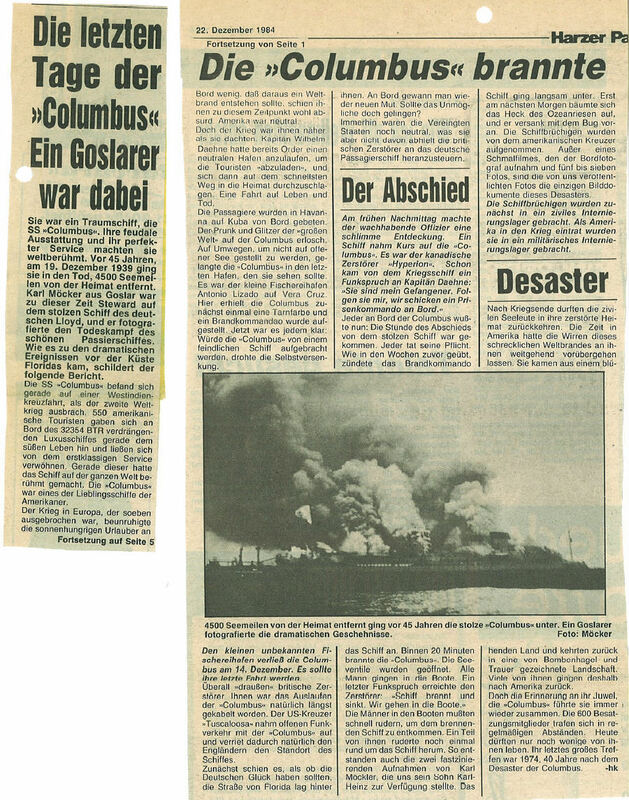 ii) Two images of the burning Columbus. Karl-heinz has also provided i) a number of very fine Seydlitz images, available here, & ii) an article, published in the Goslar press in 1984, which refers, I understand to Karl M�cker. Available here. The webmaster, with his inability in German, is unable to offer a translation! But Karl-heinz, who speaks no English, has done his best to provide an English translation - here, but would welcome corrections. 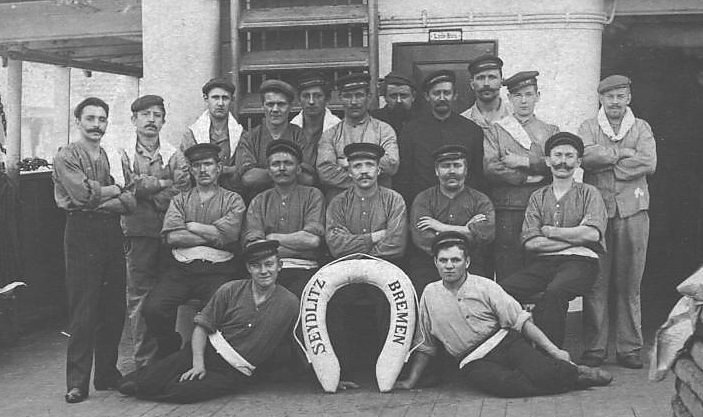 Now it would be good to be able to tell you that the image which follows bears some relationship to the Seydlitz crewmembers whose names as are listed above. But I cannot do that. It is most of a postcard image of crew members of the vessel but it has no indication on front or back as to its dating. And the vessel had a very long life indeed - from 1902 to 1933 as is indicated above. But I show it to you nonetheless. Because it is visually interesting. And quite scarce, I think. Perhaps an expert on postcards might be able to roughly date the card by its divided back and by a reference on the back to Kodak Austral, in a square shape that frames where one would affix a postage stamp. That is all I know. Can anybody provide any further details? The composite image which follows is based upon a postcard which was sold on e-Bay in Aug. 2003 - for U.S. $25.00. The front of the card you can see, lightened up just a little & with a black mark removed. 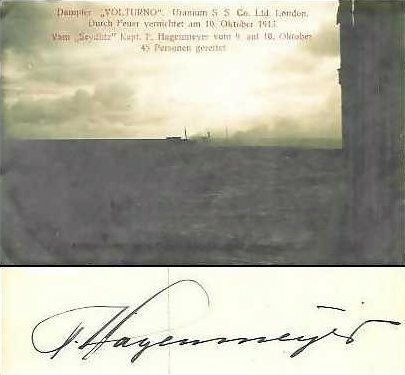 The back was all blank except for the signature of the Seydlitz captain i.e. Captain F. Hagenmeyer. I have trimmed the signature side as you can see. I had a debate with myself as to whether this image should best be on the Volturno image page or right here, & in view of the Captain's signature I decided that here is the appropriate place. I am delighted to have now heard from Melissa Groeneveld, who was, in fact, the purchaser of the above postcard, & whose family were aboard the Volturno on its fateful trip. And while I speak no German, those of you who do speak German may wish to read the following words which were printed on that card. 'Damfer� VOLTURNO� Uranium� S. S. Co. Ltd. London. Durch Feuer vernichtet am 10. Oktober 1913. Second & third Seydlitz pages are here: 94 & 95.